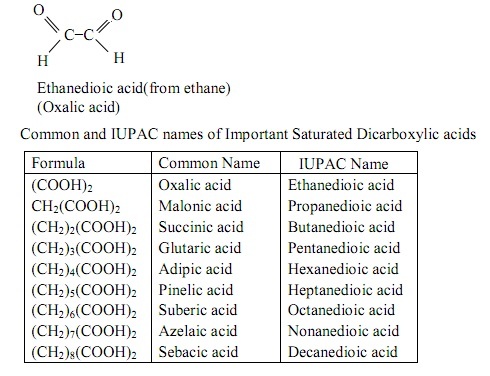 As the name recommended, dicarboxylic acids have two carboxyl groups. They might be saturated and they might be unsaturated. The saturated dicarboxylic acids encompass the general formula CnH2n(COOH)2, n might be equivalent or greater than 0. The saturated dicarboxylic acids are generally named according to the source from which they are obtained. For illustration, the oxalic acid is obtained from the plant of oxalis group. In the common system, the position of substituents is pointed out by Greek letters while in the IUPAC system; it is pointed out by numbers. 1) By the oxidation of dihydric alcohols, hydroxyl aldehydes, hydroxy acids, dialdehydes and aldehydic acids with dilute HNO3 or potassium tetraoxomanganate (VII). 3) By treating the halogen substituted mono-carboxylic acid ester with zinc or silver and hydrolyzing the ester therefore obtained. 1) State: All the dicarboxylic acids are colourless crystalline solids. 2) Solubility: The lower members are soluble in water. Solubility in water reduces as molecular mass increases whereas in ether the solubility increases as the molecular mass increases. 3) Melting points: The melting points of acids with even number of carbon atoms are higher than those having odd number of carbon atoms. This is due to the reason that the arrangement of carbon atoms is zigzag in odd number acids with the two carboxyl groups on the similar side, as they are on opposite sides in even number acids. The first dissociation constant K1 is greater than the second dissociation constant K2. It is as well higher than that of the corresponding monocarboxylic acid. The higher value of K1 is because of the-I effect of one carboxylic group on the other. This effect becomes weaker because of the intervening effect of -CH2 group between the two carboxyl groups. The lower value of K2 is because of +I effect of carboxyl group (-COO-). Moreover the electrostatic repulsion due to negative charges at the ends of the dianion (-OOC-COO-) destabilizes the dianion and decreases the K2 value. The chemical reactions of dicarboxylic acids are mostly regulated by the reactivity of the carboxyl groups. 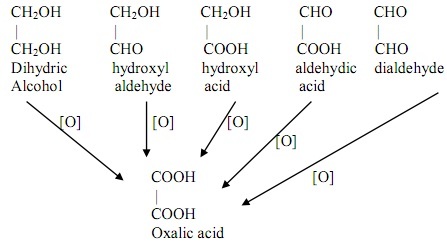 Oxalic acid distinct from the other members because it doesn't have the hydrocarbon chain and it only comprises the two carboxyl groups. 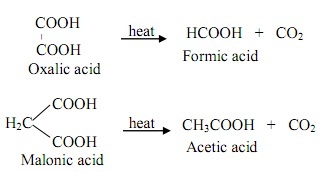 The product made on heating based on the relative positions of the two carboxyl groups. b) The higher acids in which the carboxyl groups are separated via two or three carbon atoms lose a molecule of water on heating or through distilling by acetic anhydride to provide the respective anhydride. c) If the carboxyl groups are separated via four or more carbon atoms example: Adipic and pimelic acids, cyclic ketones are made whenever distilled by acetic anhydride. d) Higher dicarboxylic acid (1:8 dicarboxylic acids) go through intermolecular dehydration to form the linear polymers. The Oxalic acid, a general dicarboxylic acid is employed in the manufacture of inks, metal polishes and oxalates. It is as well employed for textile printing. Whenever a methylene group is present between the two strongly electronegative (that is, electron attracting) group like >C=O or -C≡N, then the hydrogen atoms of methylene group (termed α- hydrogen, being present on carbon atom subsequent to functional groups on either side) become reactive or acidic. These compounds exist in keto-enol equilibrium. If the compound is symmetrical, then the hydrogen atom of the methylene group migrates to either of the keto groups however if the compound is unsymmetrical only one form is present completely or predominantly and the migration of the hydrogen atom based on the inductive effect of the alkyl or other groups present on either side of the >CH2 group. If a compound having active methylene group reacts by a strong base the proton removal might occur from both, keto and enol forms and the resulting enolate (that is, a carbanion stabilized via an adjacent carbonyl group, is often termed as an enolate ion) obtained through resonance stabilization is similar in both the cases. Some of the other functional groups such as nitro, ester and so on as well make methylene group reactive. The other such compounds which encompass an active methylene group are diethylmalonate, ethyl cyanoacetate, ethyl nitroacetate and so on. In such compound hydrogen of >CH2 group can be simply substituted via sodium or potassium. These sodium derivatives serve as the point for a number of synthetic products. Malonic ester a significant synthetic reagent having the formula H2C(COOC2H5)2. 1) Malonic ester is made by passing dry hydrogen chloride gas via a mixture having absolute alcohol and potassium cyanoacetate, on warming the mixture the cyanoacetate gets hydrolyzed to malonic acid, which gets esterifies through alcohol. The potassium cyanoacetate used is made in situ from chloroacetic acid through cyanide synthesis. 2) This might as well be made in good yield by refluxing cyanoacetic acid by ethylalcohol in the presence of the chlorosulphonic acid. 1) The Malonic ester is a colourless liquid having a pleasant smell. 3) It is sparingly soluble in water, however soluble in alcohol, chloroform and benzene. The structure of malonic ester exhibits the presence of the two carbonyl groups, one each on either side of methylene group, this applies a -I effect. As well Malonic ester is from an anion that is stabilized through resonance as it can exist in two forms - enol and keto forms. The presence of methylene group, added to the formation of resonance stabilized anion make the hydrogen of the group active (that is, acidic). 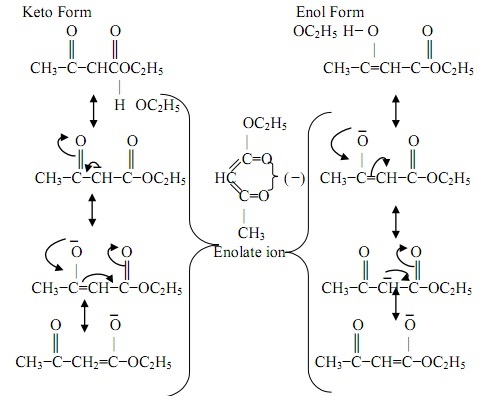 It exists in the given keto-enol tautomeric forms, the enol form being present in much smaller quantity. Due to the presence of active methylene group, it acts as an acid. If it reacts with sodium ethoxide in absolute alcohol, if forms sodio malonic ester, the anion being the resonance stabilized. 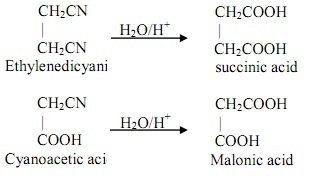 a) Synthesis of monocarboxylic acids: Malonic ester on hydrolysis makes malonic acid that whenever heated to 150 to 200oC, decarboxylates to prepare acetic acid. Monosodio malonic ester with iodine: Monosodio malonic ester whenever heated with iodine followed through hydrolysis and decarboxylation provides succinic acid. Monosodiomalonic ester whenever treated by the ester of halogenated carboxylic acid and the product hydrolyzed, it makes first a tricarboxylic acid, and then on heating it yields a dicarboxylic acid. Alkyl succinic acids can be made from sodioalkyl malonic ester and mono or dialkyl chloroacetic esters. Succinic or alkyl succinic acids can be made by the electrolysis of sodiummalonic ester or sodialkylmalonic ester. c) Synthesis of α, β - unsaturated acid: Malonic ester condenses by an aldehyde or ketone in the presence of organic bases like pyridine, piperidine and so on (that is, Knoevenagel reaction). The product on hydrolysis and heating is the unsaturated acid. d) Synthesis of keto acids: Whenever sodionalonic ester is treated by an acid chloride, a keto acid is made by hydrosing and heating the product. e) Synthesis of the alicyclic compounds: This can be taken out by the condensation of alkylene dihalide by sodiomalonic ester. The haloalkylmalonic ester formed, if treated by sodium ethoxide goes through an intramolecular alkylation reaction to make a cycloalkane carboxylic acid. Acetoacetic ester or ethylacetoacetate is the ethyl ester of acetoacetic acid and might as well regard as the acety derivative of ethylacetate. It consists of the formula CH3COCH2COO2H5. From Claisen Condensation: It is made by the condensation of two molecules of ethylacetate in the presence of a base example: sodium ethoxide. The reaction is known as Claisen condensation. This is a colourless liquid (boiling point 78oC). It decomposes and is, thus, distilled under reduced pressure. It is sparingly soluble in water however readily soluble in the alcohol and ether. However neutral to litmus, it is soluble in dilute sodium hydroxide; it is the enol form that dissolved to yield sodium salt. Acetoacetic ester acts a ketone and also an alcohol which is due to the fact that it shows keto-enol-Tautomerism. The equilibrium mixture includes both forms, though; however the percentage of enol form is extremely small. At ordinary temperature it is around 7.5 percent. The degree of enolisation based on the nature of solvent- for illustration in acetic acid it is 5 to 7 percent, whereas in petroleum ether it is around 46.4 percent.